“Final days of war” and accountability is the hot topic in the diplomatic and international arena. Let us ask the Germans and the Japanese what they thought of when the Allied Troops flattened Dresden the night prior to Valentine’s Day in 1945 in a 2 night blanket bombing using 3,300 tons of high explosive and 1,500 tons of incendiary bombs that had no strategic goals except to murder 35,000 (some argue it is far more) German civilians and create cultural hurt and the Royal Air Force bomber SIR “Harris” claims he would repeat the bombing again 30 years later! Was the atomic bombing of Hiroshima and 3 days later bombing of Nagasaki not the greatest act of terrorism in modern civilization committed 6 months after Dresden where almost 140,000 civilians died? Have the Germans and Japanese forgotten these crimes against their people by their new found friends in the international community and have the perpetrators no shame to hide behind terminologies like “human rights” “R2P” “democracy” and commit similar atrocities? Unfortunately, accountability today is simply a witch-hunt. What is simply mindboggling is the manner in which these Western nations knowing their culpabilities proudly appear in front of the world and deliver inspirational messages on human rights and democracy while they fund agencies to create regime change and even assassinate national leaders”¦. It’s simply amazing how they can function this way and the world gives them standing ovations for their speeches. It is said that Churchill “ordered” the bombing of Dresden as “payback” for the German bombing of Coventry. Killing of Osama bin Laden is said to have been “payback” for 9/11 though no single court case found him guilty or even put him on trial. If the West says a person is guilty “”…” with or without trial “”…” he is guilty but that law applies only to the White West. The Germans may like to recall these horrific memories by their new found friends. 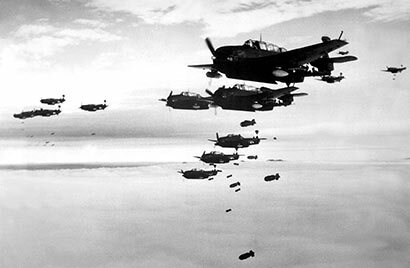 In all, over three waves of attacks, 3,300 tons of bombs were dropped on the city. Many of the bombs that were dropped were incendiary bombs. These created so much fire that a firestorm developed. The more the city burned, the more oxygen was sucked in “”…” and the greater the firestorm became. It is thought that the temperature peaked at 1,800 degrees Fahrenheit. The surface of roads melted and fleeing people found that their feet were burned as they ran. Some jumped into reservoirs built in the city centre to assist firefighters. However, these were ten feet deep, smooth-sided and had no ladders – many drowned. Very few of those in the city centre survived “”…” those that did provided a vivid picture of what it was like to be in a firestorm. The atomic bomb was developed at the Los Alamos Laboratories in New Mexico by Albert Einstein and Robert Oppenheimer and was called the “Manhattan Project” . The funds came from Wall Street “”…” the Rothschild and the Lehman Brothers. But not surprisingly, immediately after the bombings of Hiroshima and Nagasaki what does the Allies go and do “”…” they try the Japanese officials for “war cries” at an International Military Tribunal which met in Tokyo from 1946 to 1948 and found 38 Japanese military and civilian leaders guilty of atrocities and surprise, surprise no one was charged for the atomic bombings. Do we laugh or cry? When the UN General Assembly asked if the threat of nuclear weapons was permitted under international law in early 1990s the World Court concluded that use of nuclear weapons was “unlawful” and the threat of using nuclear weapons was also illegal under the Hague and Geneva Conventions (10 of the 14 judges). Therefore, by virtue of these being in existence at the time of the atomic bombings “”…” the US stands guilty. How do we align this type of dastardly attack with Sri Lanka is that since UK and US are well aware how they have ordered civilian populations to be bombed unnecessarily they must be concluding that Governments like Sri Lanka must be applying that same theory. We are extremely sorry to say that they are totally wrong to conclude so “”…” the Sri Lankan army did not target civilians “”…” the FINAL DAYS OF SRI LANKA’s WAR saved hundreds and thousands of civilians. The UN covers upto 13th May 2009 “”…” it is from there upto 19th May 2009 that has become a competition amongst foreign politicians and media to come up with guestimates of civilian deaths and they can’t even prove that such numbers even lived in these areas or provide names of kith and kin related to the dead. They are ghost numbers that find perfect reason to humiliate Sri Lanka’s victory over terrorism. 6000 of Sri Lanka’s national heroes sacrificed their lives trenching through landmines and other traps laid by the LTTE to save 294,000 civilians. This is not one or two numbers “”…” this is TWO HUNDRED AND NINETY FOUR THOUSAND Tamil civilians and gave them food and water thus far denied by the LTTE and provided First Aid. Look at the footage of the men, women, children and elderly that the Sri Lankan army saved to see how malnutritioned and feeble they were and UN can confirm this. Therefore, we would like to know what Germany and Japan in particular say of the final days of war in their country where civilians perished in thousands by US and UK bombings “”…” the deaths of these people cannot be forgotten for strategic advantage!